What the heck is an LED anyway? 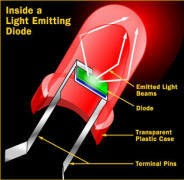 Light emitting diodes, commonly called LEDs, are real unsung heroes in the electronics world. They do dozens of different jobs and are found in all kinds of devices. Among other things, they form the numbers on digital clocks, transmit information from remote controls, light up watches and tell you when your appliances are turned on. Collected together, they can form the text and images you see on an LED sign. Basically, LEDs are just tiny light bulbs that fit easily into an electrical circuit. But unlike ordinary incandescent bulbs, they don’t have a filament that will burn out, and they don’t get especially hot. They are illuminated solely by the movement of electrons in a semiconductor material, and they last just as long as a standard transistor. EMC – Electronic Messaging Centers are available in single color, full color and full video options. Pitch – This is the spacing from center to center on the pixel You will find that a smaller pitch will make the unit seem clearer from a closer distance. Larger pitch is required for greater viewing distance. Pixel Matrix ? number of pixels (H x W) that make up the display area. Exposed pixels – The exposed style will yield a wider viewing angle while emitting a brighter image. This is especially noticeable in full sunlight. It is also easier to cool because the LEDs are in the open air as opposed to being inside the cabinet.